My guest this week on Destination Unlimited is a woman who, like myself and many of the guests I welcome to the program, most definitely marches to the beat of a different drummer. By profession, she is a Medical Laboratory Technologist specializing in Hematology and Transfusion Medicine. By calling she is a Wellness and Inversion enthusiast, nutrition lover, Spiritual Researcher, World Traveler, Sound Healing Guide, Explorer of True Human History, Alternative Researcher into Human Potential and a Teacher of Love. She’s been described as a cross between George Carlin and Minnie Pearl! You may recognize her if you see a lovely and enthusiastic woman walking down the street wearing a Tinfoil Hat! 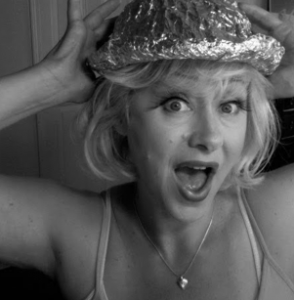 Join me at 8PM EDT as I welcome the Tinfoil Hat Lady, Beata Van Berkom.